During our research into 2nd Battalion during the War, we were fortunate enough to be contacted by Harry. Harry was a Warwick veteran himself having served with the 2/7th Battalion, a Battalion set up as part of a new Division to go overseas as reinforcements to British troops in the Middle East. Thankfully these troops were never needed as the War came to an end before their deployment. Harry was not demobbed until 1948 and was shipped to Palestine as part of the British peace keeping force where he was transferred between a number of units as well as the Royal Warwicks. Although Harry was conscripted into the Army, and said it was never something he wanted to do, he laughs that 'I didn't like it, but I can never stop talking about it'. He also had some great stories to tell, such as an example of British Army punishment or 'Jankers' in Palestine, which was, in this case was to pick shells and stones, by hand, off a beach used by unit officers, before depositing them via wheelbarrow a mile up the beach... only for high tide to come in re deposit everything removed straight back onto the beach! These days Harry still owns a Royal Warwicks battledress, which he wears to re-enactments he attends. 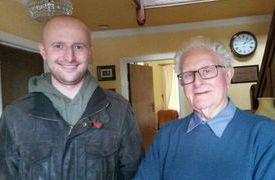 It's a great privilege to have met him a number of times and we are honored he chose to share with us his recollections of his time in the army, and the recordings of his late friend Sjt Robert 'Bob' Barnett, Intelligence Sjt for 2nd Battalion during the war which can be found on our website.